South Holland Council has issued a warning to benefits cheats after a woman who falsely claimed over £16,000was jailed for three years. Maria Pridmore, of Angel Lane, falsely claimed benefits from South Holland District Council and the Department for Work and Pensions between 2010 and 2013. During this time Pridmore failed to tell officers that she was living with her husband and didn’t inform them when she moved to a new address. She also made a false claim in March 2013 stating that she was living at an address in Spalding with three children. However, she was not a resident there and there were no children living with her, in fact two of her children were deceased. Following a prosecution taken by South Holland District Council, Pridmore appeared at Lincoln Crown Court on Friday for sentencing having already pleaded guilty to seven charges of benefit fraud. The court heard that Pridmore had falsely claimed a total of £16,931 from South Holland District Council and the Department for Work and Pensions. In total Pridmore falsely claimed £10,019.05 in Housing Benefit, £5,510.74 in Income Support and £1,401.27 in Council Tax Benefit. Last year South Holland District Council teamed up with other Lincolnshire authorities to launch the ‘Tell Us’ campaign which urges residents who claim benefits to inform local councils of changes to their circumstances. Coun Peter Coupland, portfolio holder for finance, said: “This case highlights the importance of telling your local council about changes to your circumstances if you are claiming benefits. “Maria Pridmore also made false claims and we would like to make it clear that this is a very serious offence which will not be tolerated. If you claim Housing Benefit or Council Tax Support and have had a change in your circumstances, such as income, tax credits or the number of people living in your house, please contact South Holland District Council to report this change. If you would like to report suspected Council Tax Support fraud contact the council on 0800 002 008. Suspected cases of Housing Benefit and DWP Benefit fraud should be reported to 0800 854 440. A mum who lost 16 babies before having a ‘miracle daughter’ was today (Friday) jailed for three years after she used two of her dead children’s identities to claim benefits.Former nurse Maria Pridmore (36) suffered 14 miscarriages, a stillbirth and the death of an infant son over a heartbreaking 13-year period until she successfully gave birth in 2012. Lincoln Crown Court heard she continued using the dependent child, named Kia, to claim benefits even after his death at two weeks in December 2009. She also made other claims relating to a stillborn baby, named Shannon, and another child who was not living with her, pocketing more than £16,000 worth of housing benefit, council tax benefit and income support in total. Pridmore was claiming to be a lone-parent with dependent children in order to claim the benefits, but at various times failed to notify the authorities that she had moved or was actually living with her then partner as though they were man and wife. In total, the cheating mother fraudulently claimed £10,019.05 of housing benefit, £5,510.74 in income support and £1,401.27 in council tax benefit. The court heard Pridmore was also a serial fraudster who also stole more than £30,000 from four women and even used one of her victim’s bank details to pay for a £60 taxi fare to one of her many court appearances. Sarah Munro, prosecuting, told the court police also have information that Pridmore is still claiming tax credits despite her most recent convictions. During the investigation it was discovered that in 2010 Pridmore sent the authorities Kia’s birth certificate and a letter showing a lone claim to child tax credit for him. Attached was a handwritten letter from Pridmore giving the dates of birth for Kia and Shannon. Pridmore also asked for her son to be included in a claim after she changed address and provided a birth certificate for another child born in 2012. In this claim Pridmore supplied a letter dated March 2012 which showed child tax credit being paid in respect of Kia and Shannon. Tax records also showed Pridmore received an additional 25 per cent discount for being the only adult in her property. It was later discovered Pridmore was potentially living in a husband and wife relationship with her partner, John Foran. There was also evidence Pridmore was making claims to benefits such as income support and tax credits for children that were deceased and another child who did not live with her. It was also suspected Pridmore had been receiving housing benefit for a property but had not been resident there from February 2012 and that she had been working at various employers without declaring her income. After Pridmore’s claim to income support was cancelled in 2013 she sent the authorities a change of circumstances letter which stated she was resident with Shannon, Kia and another child. It was not paid due to suspicions the information was incorrect. John Foran provided a statement confirming he had lived with Pridmore from November 2009 but that they had separated in December 2011. He also confirmed they had one child who did not live with them and that Pridmore had been working at various times. Pridmore failed to attend any appointments with the investigator. The court heard Pridmore was also a serial fraudster who pocketed more than £30,000 after targeting four women. In 2013 Pridmore stole over £14,000 after linking a credit card belonging to one woman to her pay pal account. 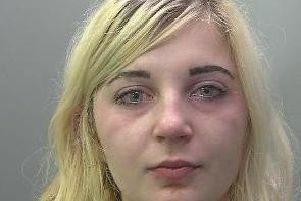 She also set up an account with “Fashion World” in the name of that woman, taking more than £250 of items, and obtained a further £2,850 in cash from a bank by pretending to be her. A year later Pridmore also stole mail and the identity of a friend of 13 years, and used the information to withdraw over £6,000 in over the counter and telephone banking withdrawls. It left the friend and her teenage daughter too afraid to leave their house in case Pridmore broke in. Pridmore also targeted a 79 year-old dementia sufferer, after approaching the pensioner outside Spalding police station in 2015. Pridmore took her home and befriended her daughter-in-law after after claiming her mother had recently died and she was working as a Macmillan nurse. She later took the pensioner to the bank and used her bank card to withdraw £250. The following day Pridmore used the card again to steal a further £300. In the same year Pridmore stole £2,800 from an 84 year-old woman after meeting her at the bus station in Boston. Pridmore took the money using the lady’s ATM card and also used it to buy over £500 worth of goods. The lady was considered so vulnerable she could not make a formal statement. Miss Munro told the court even after the elderly lady was taken in to a care home Pridmore continued to use her details to transfer over £5,000 out of her account and even used her bank card to pay for a £60 return taxi fare to court. Pridmore also carried out a string of shop thefts and even stole a £1,331 flat pack kitchen belonging to her own father just days after his wife’s death. Pridmore denied the theft when she was challenged by her father and was throw out of the house. In newspaper interviews four years ago, Pridmore said she suffered her first miscarriage aged just 19. She then experienced the trauma of a further 13 miscarriages and a stillbirth. She said she gave up all hope of successfully raising a child when Kia, who was premature, died. But she finally achieved her dream of becoming a mother with the unplanned ‘miracle’ birth of a daughter in 2012. The court heard Pridmore had become hooked on heroin but had recently returned negative drug tests. David Eager, mitigating, said Pridmore was a “decent human being” until she suffered a stroke. Mr Eager said: “Anybody who has followed this case over the last two years will find it hard to believe she can even lie straight in bed. “She is a Walter Mitty, but she hasn’t always been. She was a nurse. “Her personality seems to have totally changed since she had a stroke. Passing sentence, Judge Simon Hirst said Pridmore came from a good background. But he told Pridmore he had to pass a jail sentence for the frauds and thefts which totalled £55,928. Judge Hirst said: “Over a period of about six years you behaved in an utterly dishonest fashion. Pridmore, of Angel Lane, Holbeach, admitted seven charges of benefit fraud between August 2010 and March 2013, 19 charges of fraud and theft between January 2013 and May 2016 and stealing her father’s kitchen in April 2015. She also pleaded guilty to a series of shop thefts and obstructing a police officer.